The venture marks Baidu's intent to become a major player in autonomous vehicle development. 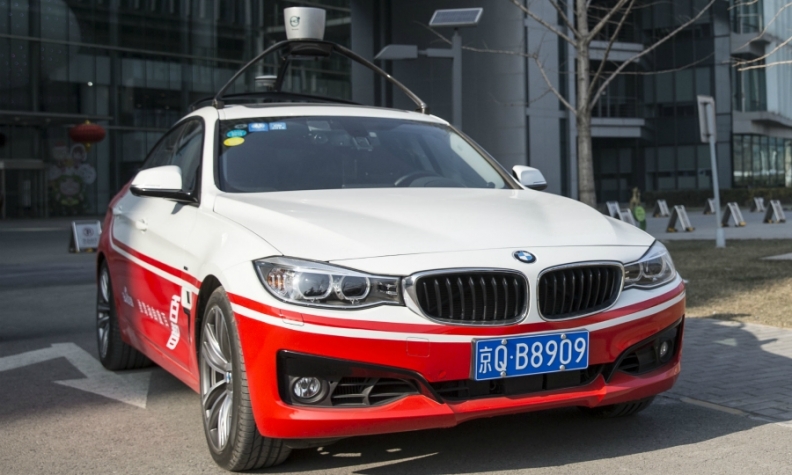 Baidu's BMW-based self-driving car is pictured. Chinese tech giant Baidu is relying on Microsoft to extend its self-driving car ambitions outside of China. The two companies first said they were working together as part of Apollo, Baidu's open-source autonomous vehicle platform developed in collaboration with 50 automakers, suppliers and tech companies. Baidu, a search-engine provider similar to Google that has become one of China's largest tech companies, and Microsoft released further details of the partnership on Tuesday. Microsoft will provide data storage, security and artificial intelligence services to the project. "We are in the process of spreading this globally," said Ya-Qin Zhang, president of Baidu, in an interview with Automotive News. "By partnering with Microsoft, we can expand the capabilities of Apollo to global partners." Microsoft's Azure cloud storage service manages data in 40 regions worldwide, including the U.S. Access to this network would allow self-driving cars running on the Apollo platform to process and store information, such as map and roadway updates, in those areas. Apollo, which counts Robert Bosch, Continental, Nvidia, Ford Motor and Daimler among its contributors, is a software suite that will allow autonomous vehicles to perceive and locate themselves within their surroundings, plan routes and control mechanical functions. The platform is open, meaning manufacturers can use the entire suite, or just specific features, and incorporate their own technology on top of it. Baidu first announced the Apollo initiative in April. Zhang said the platform will likely be on roads with the first Level 4 autonomous vehicles -- cars that require no human interaction in defined conditions -- which he expects to deploy on a small scale in the next two to three years. The venture marks Baidu's intent to become a major player in autonomous vehicle development. The Chinese tech giant is operating a 200-employee artificial intelligence research facility in Silicon Valley, staffed with former Google, Facebook and other tech veterans. And with the ability to run in the U.S. on Microsoft's cloud platform, the Chinese tech giant can bring Apollo to the home turf of rivals Waymo and Apple. "Our purpose is clear," Zhang said. "We want to create a vibrant autonomous driving ecosystem worldwide."